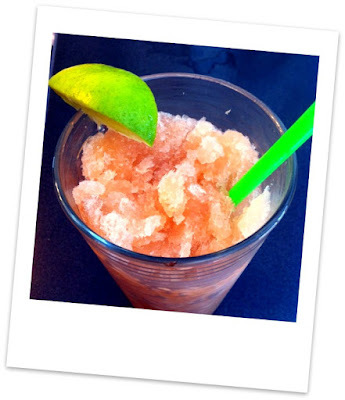 154 Hidden Court: Frozen Chambord Margaritas to get your weekend started off right. Frozen Chambord Margaritas to get your weekend started off right. A few weeks ago while doing important work on my computer - which is also known as wasting hours of my life on Pinterest, I came across a recipe for Chambord Margaritas. I thought I pinned it to my "Recipes I want to try" board. See, RJ LOVES Chambord, but I've never been a huge fan. However, I've never met a margarita I didn't like. It was definitely a win-win situation. When I came back a few days later to print it out, it wasn't there. I searched for it, but could never find it, so I did what all resourceful rednecks who need to get their drink on do - I made one up, partly from memory and partly based on what tasted good. It was definitely a keeper. It also got both me and RJ drunk faster than anything I've had since that one hooch party in college. Either we're getting older and can't hold our liquor any more, or this stuff is potent. Get a big freezer-safe bowl, one that you won't mind being out of commission and in your freezer for a while. Open the limeade and pour it in. Using the now-empty limeade can, fill it up with tequila, then pour that in. Now, using the limeade can (see a theme here? ), fill it up with a mixture of Chambord and Triple Sec that is to your liking. I did about half and half; next time I'll probably up the Chambord and cut back the Triple Sec just a smidge. Add that to the bowl, then add the lime juice and sugar, and three cans of water, and whisk it all up until it's blended. Taste it to be sure you like it, then put it in the freezer. Check back on it every couple hours to stir it, and to make sure it still tastes good. It took about 6 hours in the freezer for mine to get to a good slushy consistency. Scoop it into glasses, serve it with a lime wedge and/or in a sugar-rimmed glass. Drink it, then either a) go to bed immediately or b) dance with a lampshade on your head. I know which option I prefer. Can I pay you to come and make those for me??? I STINK at being a bartender. Everything ends up tasting nasty.